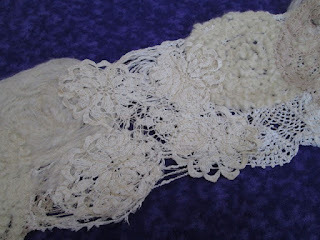 Last Friday I started this Lace Scarf with my Surface Design Group. Five of us gather about once a month and one of us leads the group in a technique or project that is fiber related. Last week Yvonne lead us in Crazy Felt. Two of the other ladies had done some of this before. Basically we used two layers of wash a way stabilizer and filled the inside or middle with fiber and then machine stitched like crazy to get it all held together. This is my scarf before I washed it. You can see some shiny stuff sticking out from the edges and that is the wash a way stabilizer. 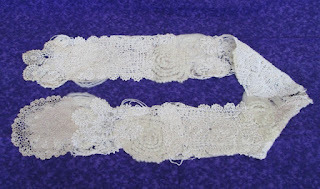 I machine stitched and stitched to hold the layer all together. I used a large collection of handmade dollies I had been collecting. I really wanted the ends to show off the fine details. I used white and cream and slightly aged looking dollies. 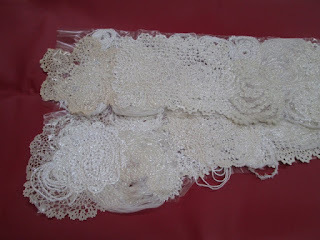 I also used five or six different yarns as well. I used two wool yarns and hoped they would felt a little and peek though a dolly or two. When I laid out the yarns I tried to get a spiral. 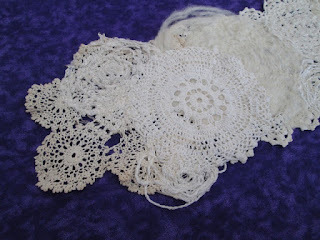 I am so in love with my new scarf that my head is spinning with other ideas I could make using the dollies and yarns. I hope I can find time to do something more. I hope I have enough dollies, this used so many. 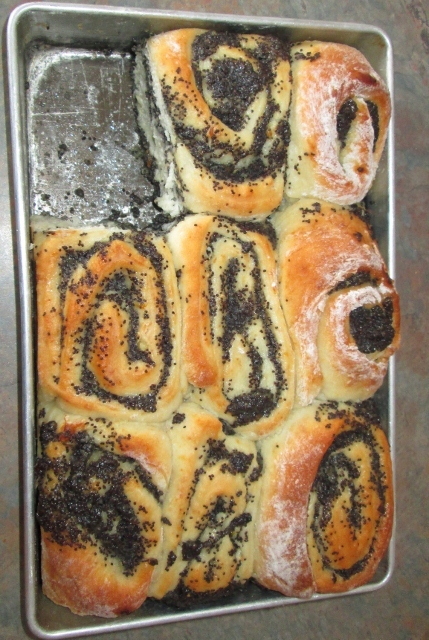 I also baked Poppy Seed Rolls. Yes one kid got his piece before I could get my photo. It is really good. I used some home made marmalade in the poppy seed mixture, so it a hint of bitter orange. Very cool scarf! 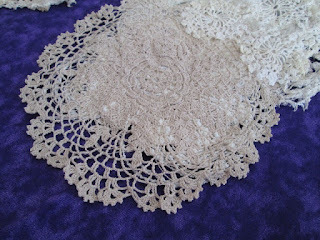 And an awesome way to use those doilies! What a pretty scarf you made. 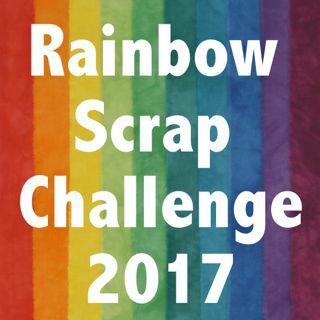 You have a very creative group for your monthly meet ups. This looks like a really cool technique - thanks for sharing! Very fun scarf Cathy- I love doilies and this is such a lovely way to use them. You do find the most interesting things to make wonderful creations.